Every now and then Volcanic make a small change that has a big impact. 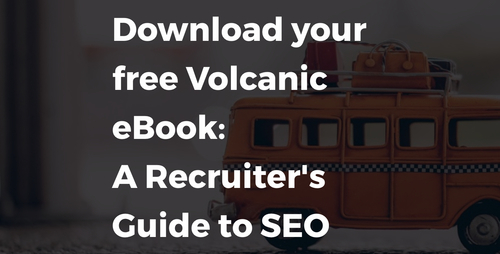 The team here at Volcanic have been developing one of the most advanced SEO features ever delivered by any recruitment specialist and this will significantly improve our customers' performance straight out of the box, no plugin, no extra's just effective SEO. So what's the change and why is it important? A few months ago we released a new feature called location pages and job titles. We took our inspiration for those people at Google who have been stating they want to see a more relevant and personalised content. Soon after the release we undertook a trial of it's impact and what we learnt was that more work was still needed. We didn't get it right first time, so we continued to develop the feature and then carried out another small trial with a selected customer and only when we were confident of its success would we release it to our wider customer base. Today, we released the full power of the seo location pages and job titles to all our customers. From today our customers will be able to create thousands of unique pages with unique content which includes all the unique Meta Titles and Meta Descriptions. In addition, we have made this fully international with full multi-lingual support, straight out of the box, making this a truly global offering. As always with SEO the results are never immediate, however we are confident that as a result of our trials, we have now delivered a significant product improvement and one that will deliver results to our customers. This is an example of one of the many SEO improvements we are making to the platform over coming months with our SEO console you'll be in complete control without any additional costs.